At Athom, we’re extremely proud of Homey’s success. However, we would not be here without our community. Without their feedback and support Homey would never have been where it is today. It’s really important for us to see in what Homey makes users’ lives easier, more fun and more connected. So we’re taking the initiative to visit members of our community to see how they use Homey in their day to day lives. Every month we’re sharing one of these Homey Stories with you. Enjoy! We’re travelling to the other side of the Netherlands for the first edition of Homey Stories. We’re meeting Julian to take a look at his Homey-setup. Julian has a beautiful home: a characteristic house built in 1926. This could limit one’s approach to home automation. However, it doesn’t withhold Julian from making his house fully smart. 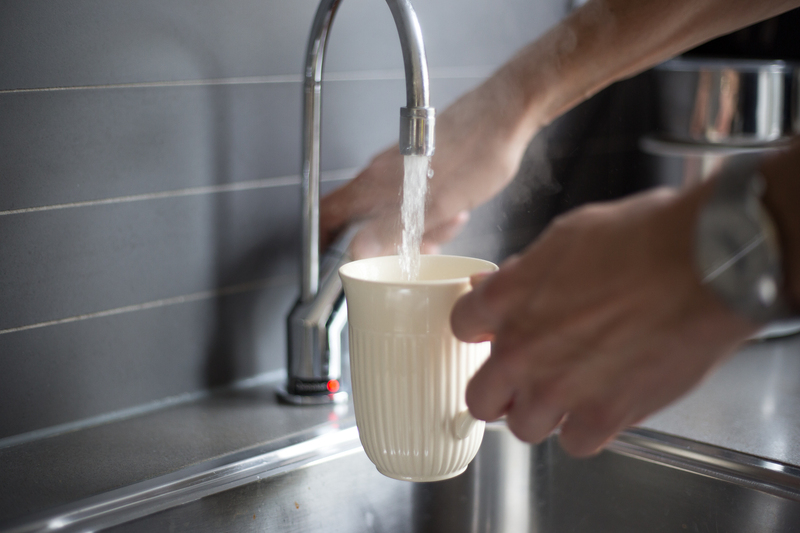 Right from the moment we’re offered tea, it becomes clear that practically everything in this house is connected through Homey. Julian found out, through Homey Insights and a smart socket, that his Quooker uses a lot of energy during the nighttime. 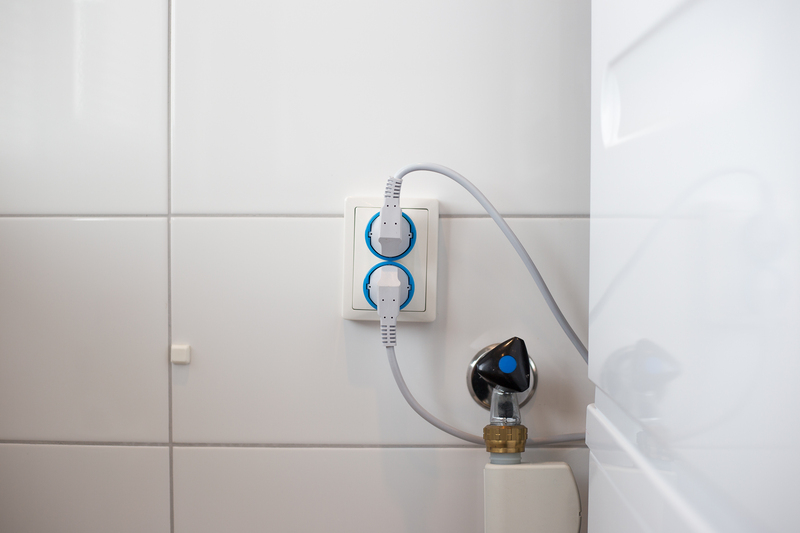 The smart socket, controlled by Homey, turns off the Quooker at night saving a lot of energy and money. Julian originally took on the challenge of making his home smart(er) with a few KlikAanKlikUit sockets and a Homewizard. In the meantime, the Homewizard is on the bottom shelf of the cupboard, because of Homey’s convincing release. Once Homey was delivered to his home, Julian found out that – in contrast to his expectations – not speech, but the Flow-Editor is the most powerful function of Homey. “Almost everything at home is automated. However, I do have to keep an eye out I don’t start automating things for the sake of automation. That won’t necessarily make me any more popular with the family.” Julian enjoys talking to Homey, but the Flow Editor enables him to create an automated eco-system in his house. Through custom Flows, Homey enables his family and his house to live together in harmony. The curtains automatically go up in the morning and after movienight the lamps gradually start lighting the room again. “That way our eyes can get used to the light again”, Julian explains. The community helps out Julian as well. HomeyDash, a great app developed by a member of the Homey-community, found its way into Julian’s home. 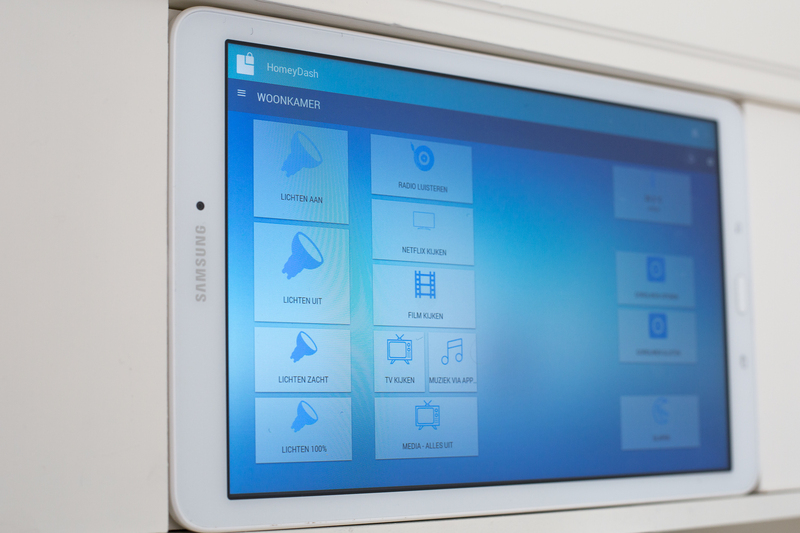 A tablet is mounted to the wall, allowing everyone at home to control Homey and the devices connected through Homey. We finish with a tour around the house. The gameconsole in the study automatically powers on when somebody turns on the TV. Homey sends out a notification when the washing machine in the attic finishes. 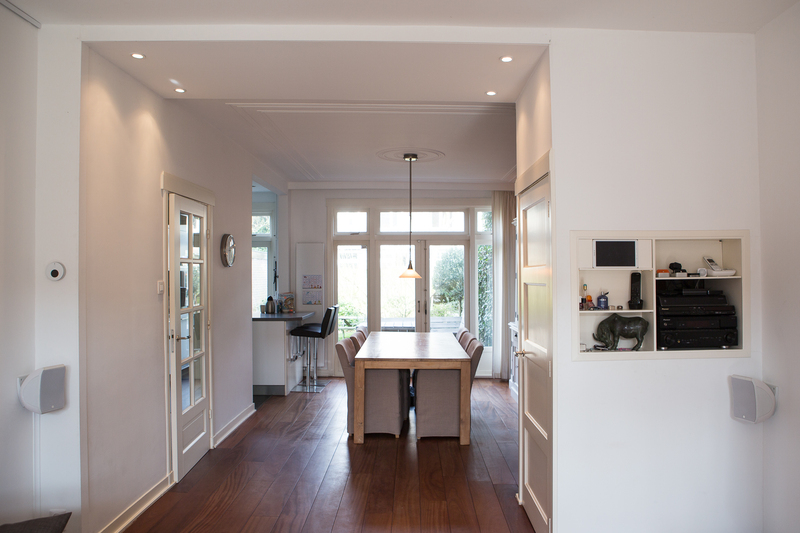 Because of Homey Julian can gradually expand his home automation set-up and is able to keep connecting new devices. He calls himself a ‘well-meaning amateur’, but he made his house live and react to him and his family exactly the way he wanted to. Because of Homey’s broad range of supported wireless technologies he is able to automate his home without losing its authentic identity. Julian isn’t done though. “Recently, the trees down the street were cut down, so we need blinds. Of course they have to be blinds I can connect to Homey!” We’re looking forward to our invitation to see how that turned out!